This may be caused by overuse such as sitting at a desk or computer throughout the day, looking down while running, or repetitive motions. Start in a seated position, lean their head forward, chin down to comfortably stretch the back of the neck. Before removing the backing paper, begin by measuring a few inches from the hairline and vertically placing the strip down the back. 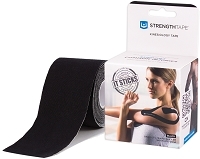 With the first strip of StrengthTape, tear the backing paper and stretch the tape to help remove it. Anchor the ‘Champion’ end of the tape at the base of the hairline next to the spine. Avoid touching the adhesive side of the tape. Then with 25% stretch, remove most of the backing paper except the end and place it next to the spine going down the back. Finish with the end of the tape at 0% stretch. 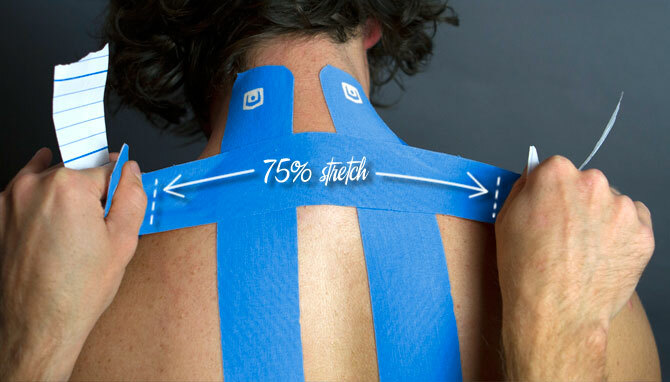 With the second strip, mirror the first on the other side of the spine at 25% stretch. 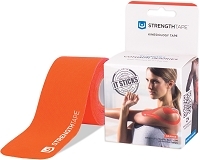 Take the 3rd strip of tape and tear the backing paper to remove it from the tape. 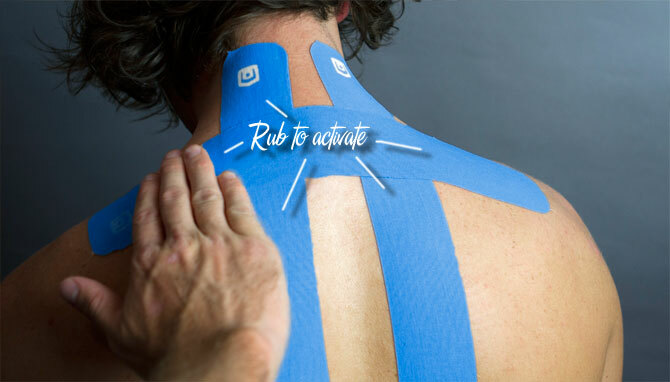 With your thumbs, evenly stretch the tape to 75% and place the tape horizontally across the top of the shoulders over the base of the neck.. Remove the remaining pieces of backing paper and apply the ends of the tape as anchors to the skin with 0% stretch.